Imagine the possibilities. If only you could develop your system of wireless Internet of Things (IoT), a brain for your connected home, wearables, car or other low-powered smart products. If only you had the hardware for prototyping your IoT system, the software framework, the network stacks and the cloud infrastructure to boot. Then maybe you’d have somewhere to start, the necessary hardware building blocks to kick-start your computing. What if you were able to connect securely and authenticate your wirelessly-linked connected devices, and make them talk to each other and the cloud? Well, all this is no longer a pipe dream. Developers, or anyone who is technically-minded, can now make this and more practical reality using the new Creator Ci40 IoT developer’s kit. As of this writing, the crowdfunding campaign for the development of the toolkit over at Kickstarter is already a success, surpassing the initial goal of £20,000 thanks to over 300 backers. The company, definitely not a start-up, chose the Kickstarter way, saying it needed the crucial and precise feedback from developer communities that such a crowdfunding campaign tends to reach. What is Creator Ci40 Dev Kit? Imagination Technologies, the technical brains behind the development toolkit, is launching what they term as the next generation’s connected projects’ ultimate dev kit for IoT applications. Backed by a host of open-source software and hardware and cloud infrastructure, the Creator Ci40 is, on paper at least, prepped to be the backbone of tomorrow’s MIPS-based IoT architectures. Imagination Technologies is a global company with an impressive catalogue of hardware that runs in (or runs) at least one of your connected gadgets. 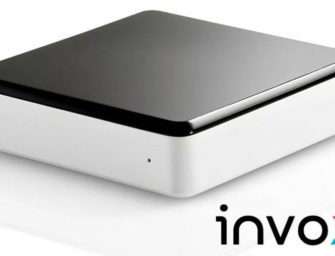 Its hardware offerings include PowerVR, MIPS, and Ensigma. Some of the company’s clients include connected devices dealers such as Broadcom, mobile device makers Apple (an investor with an 8.4% stake), Samsung and LG, as well as chip makers Intel, Qualcomm and MediaTek, and so many others. If this development setup sounds like your favourite beat, then here are some technical details to sing along. IoT hub powered by all a new, dedicated MIPS chip to ensure optimal IoT applications operation but that uses low power. More precisely, the dev kit’s engine is a cXT200 SoC that includes a dual threaded, duo core MIPS (InterAptiv) CPU, manufactured by GlobalFoundries using a 40nm process node. It also specs an Ensigma C4500 RPU. 6LoWPAN expansion clicker boards powered by 2 AAA batteries–features a MikroBUS socket ( you can add sensors to the main interface through this socket ).. Triple the number of Click Companion Boards, motion sensor, temperature sensor, and relay switch–with the option to get numerous more from MikroElekronika Software. Open source software and hardware frameworks, network stacks and cloud connectivity. Use FlowCloud cloud service by Imagination Technologies to register your devices, connect them to the internet, have access to partner-supporting services and make fluid updates to your project. Imagination has done all you technical minds a big Honor and created a detailed video on the Creator Ci40 to watch it work out its magic. First, set a standalone wireless device–by mounting any click board on to a battery-powered clicker expansion board. Make the standalone device communicate with the Ci40 IoT hub over the 6LoWPAN network by programming it. Use the Ci40’s connectivity support for Fast Ethernet (USB), Bluetooth and 6LoWPAN, dedicated 802.15.4 WI-FI and SPI to connect multiple peripherals. Upload the data to FlowCloud for further digging and summarising. And you are done! Why Choose the Creator Ci40? Imagination Tech’s latest dev board is not the only setup aiming to ease, smoothen and quicken IoT applications development. The competition is stiff, including from its stable mate–the Creator Ci20, the first in a line of boards built by Imagination Technologies. Some other IoT starter kits and cloud-based resources include Wunderbar from Relayr, and Spark Core IoT Dev setup and SparkCloud platform both from Spark Labs. However, according to Senior Technology Marketing Specialist at Imagination, Alexandru Voica, the Creator is built from the ground up and offers an edge over the competition. Google has hand-picked this particular dev kit to feature in its Brillo golden reference program. That means that the kits will receive updates and patch up jobs before anyone else does–developers can keep up front and ahead of the competition, pretty much like what happens with Nexus phones. Multiple expansion boards and sensors to make this your all-in-one IoT hub. The pre-built open source software framework will help developers to get started right away and not to start wondering how to make their systems to communicate with each other from scratch, according to Voica. The Creator Ci40 will support most popular versions of Linux. In fact, the setup will run Linux distributions such as OpenWrt, Buildroot, and Debian. Imagination’s offering is build from scratch. And instead of relying on pre-existing chips and hardware, which are clearly power-hungry, developers will be able to utilise high-performance but using only two AAA batteries. The company is introducing MIPS-based processors and PowerVR graphics for smoother operation – in a market dominated by ARM-based products. Access to FlowCloud IoT framework at no cost at all for further analysis and reporting. Start-ups can work with their budgets and strip expenses using this cloud platform from Imagination Technologies. The absolute maximum voltage the board can handle is 9V, 3A. The LEDs onboard are user-programmable and come in the standard red colour. Easily flash and recover from the NAND flash memory after an upgrade, OS change or other unplanned incidents. Well, it is a good thing to know the likes of Apple and Google are involved. Probably, meaning long-term minded development support in addition to secure connections, technical know-how and support for creators, and credible force to crash bugs fast and efficiently. Creator Ci40 Price – How much for the dev kit? Pricing for the toolkit will start at $80 for backers who fund the campaign early on at Kickstarter. The full kit will ship with 1X Creator Ci40 board, 2X Clicker expansion board, and 3X Clicker sensor board. However, developers can get more. For example, one Kickstarter backer who’s pledged 350 GB Pounds will receive five Creator Ci40 Dev Kits: Meaning a total of 5 Creator Ci40 boards, ten clicker expansion boards, and 15 clicker sensor boards. If you are interested, but wondering if there are restrictions based on location, everyone from anywhere around the globe is invited to make a pledge. And if all goes as planned, backers could get their rewards early on in April 2016.